Since I wanted to avoid some needless morning traffic in a recent stay in Boston, I made sure to make my hotel stay right outside the city. Knowing that I had to head west on 90, I found (what turned out to be) a Super 8 not too far from a reputable establishment called Taste Coffee House. After checking out of the hotel, I made a quick five minute drive to Taste Coffee House, located on a nice open street accompanied by many other small businesses. 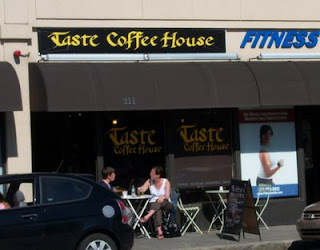 Taste has a basic tan exterior with a black and yellow sign and a few tables below it. Inside, the shop proved long and cozy, possessing a fair amount of table and bar seating. The coffee comes from Massachusetts' favorite coffee roaster (or at least what seems to be), Terroir Coffee. From Taste's assortment of pump pots I chose the Taste Coffee House Light blend, a drip that had the taste of sweet tea, bread dough, and hints of almond. The brew all together made for a nice light coffee, though the batch I sampled proved a bit stale (I guess more people picked the dark blend that morning). I also ordered a double espresso, also from Terroir that day (though they do switch up their espresso offerings from other places). The barista pulled two good shots that held delicious complexity; a tang of lemon, tinges of fig, a smooth body and an overall bright oral presence. As for other drinks, the tea is free leaf and they also serve beer and wine. Quite pleased with my fortunes of both a good hotel and the nearby Taste, I left the coffee house in a most amiable mood. And to make the morning even better, I found a great whoopie pie at the nearby Bread and Chocolate Bakery (not breakfast food, but oh so delicious). Whether you're driving on a commute out or into Boston, make a stop at Taste Coffee House. the taste blog says he doesn't serve terrior expresso, are you sure thats what you had? anyone here ever try luwak coffee? It is very interesting for me to read that article. Thanks the author for it. I like such themes and everything that is connected to this matter. I definitely want to read more on that blog soon.